A "match school" is a college or university that is likely to admit you because your grades, standardized test scores, and holistic measures are similar to those of typical students at the school. You certainly aren't guaranteed an acceptance letter from a match school, but chances are better than not that you will get in.When applying to colleges, it's important to choose your schools wisely. At a match school, your grades and standardized test scores should fall within the typical range for admitted students. Ivy League schools and other highly selective colleges and universities are never match schools. They are reach schools. For a variety of reasons, it is quite possible to get rejected from a match school. Be careful not to overestimate your chances of getting in. How Do You Know if a School is a Match? Find schools that interest you in my massive A to Z index of college profiles. When you click on a college, you'll find SAT and ACT data for matriculated students. This data represents the 25th and 75th percentile of students who enrolled at the college. If your ACT and/or SAT scores are above the 25th percentile number, you're a potential match for the school. 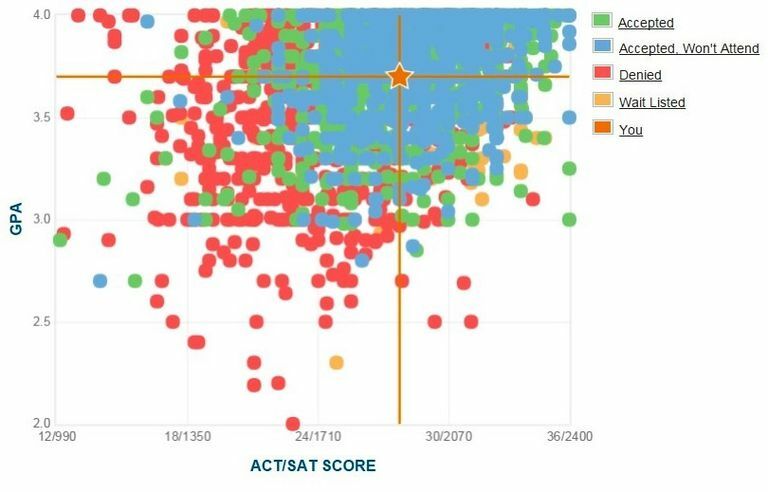 For hundreds of the schools I've profiled, you'll also find a link to a GPA-SAT-ACT graph of data for students who were accepted, rejected and waitlisted. This will give you a more visual representation of where you fit in. The college has holistic admissions, and your essay or extracurricular involvement weren't as impressive as those of other applicants. You failed to demonstrate interest in the college. Your letters of recommendation raised concerns for the college. The college admitted students who may have had similar grades and test scores but who were more likely to contribute to the diversity of the campus community. Colleges don't have formal geographic, racial, or cultural quotas, but many schools do believe that a diverse student body benefits the learning environment. You have a criminal record that concerns the college. If you're a straight "A" student with top 1% standardized test scores, you're still not guaranteed admission at the country's most selective colleges and universities. The country's top U.S. colleges and top universities have such low acceptance rates that many fully qualified applicants receive rejection letters. You should certainly apply if you wish to attend these schools, but be realistic about your chances. When a college has a single digit acceptance rate, you should always consider the school a reach, not a match, even if your grades and test scores are exceptional. I always recommend that applicants be realistic about their chances of admission, and it's important to remember that many students receive rejection letters from match schools. That said, chances are good that you will get into some if not most of the match schools to which you apply. Also keep in mind that match schools are often good choices because you'll be among peers who have academic abilities that are similar to your own. It can be frustrating to be at a college where the majority of students are significantly stronger or weaker than you. Balance is important as you come up with your college wish list. You should make sure you apply to a mix of reach schools, match schools, and safety schools.